Cubans wait outside a Havana migrations office Monday to request new passports after exit visas there became unnecessary for the first time in half a century. 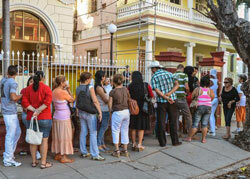 HAVANA | Cubans formed long lines outside travel agencies and migration offices in Havana on Monday as a highly anticipated new law took effect ending the island’s much-hated exit-visa requirement. The measure means the end of both real and symbolic obstacles to travel by Cubans, though it is not expected to result in a mass exodus. [With the new law in effect,] most Cubans are now eligible to leave with just a current passport and national identity card, just like residents of other countries. It’s a tangible benefit for people like Ester Ricardo, a 68-year-old Havana resident who was granted a U.S. tourist visa but denied an exit permit. She queued up early outside the office of a charter airline eager to book a flight to Miami as soon as possible. “My niece invited me, so I’m going on a family visit,” said Ricardo, who plans to be in Florida for around six months. Two well-known Cuban dissidents said they were told they will now be allowed to travel after being blocked multiple times in the past. Control over who can travel now largely shifts to other governments which will make their own decisions about granting entry visas. Cubans…will still find it difficult in many cases to get visas from wealthier nations like the U.S.
Cuba observers and foreign governments have been waiting to see how the government implements the law to gauge its effect. The measure contains language that lets the government deny travel in cases of “national security,” and one key test of the law will be whether authorities allow exits in sensitive cases such as military officers, scientists and world-class athletes. “We will see if this is implemented in a very open way, and if it means that all Cubans can travel,” said Roberta Jacobson, U.S. assistant secretary of state for Western Hemisphere affairs. “If it is implemented in such a manner, it would be a very, very positive” reform. CHINA – Communist government to end controversial forced labor camps? 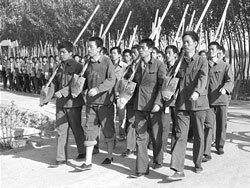 The “Re-education through labour” camp of Tuanhe near Beijing in 1986. BEIJING | China will end its controversial system of forced labor camps, Chinese media quoted the domestic security head as saying on Monday [Jan. 7], a move that would mark a first step toward promises of reform made by new Communist Party chief Xi Jinping. Chinese officials have pledged reform of the “re-education through labor” system, which has been in place since the 1950s [soon after the Communists took over China]. It empowers police and other agencies to detain people for up to four years without charge. “Use of the re-education through labor system will end this year, after approval from the Standing Committee of the National People’s Congress,” state broadcaster CCTV said on its official micro-blog site, citing the party’s newly appointed Political and Legal Affairs Committee head, Meng Jianzhu. The Justice Ministry did not immediately respond to a faxed inquiry by Reuters. The influential news magazine Caixin website also reported Meng’s comments, made during a committee meeting. No further details were available from the media reports. Meng, also public security minister, took over as head of the sprawling body that oversees law-and-order policy after November’s 18th Party Congress. [The biggest complaint that human rights advocates have with the reform through labor system is that it operates outside of the law courts, with the police responsible for sentencing offenders. Human Rights Watch has noted that this violates international law, and Wang Gongyi [of China’s Justice ministry] has also said in the past that it contravenes parts of the Chinese constitution. “They will give the system a new name, but the nature of the system remains unchanged,” said Li Fangping, a human rights lawyer in Beijing. 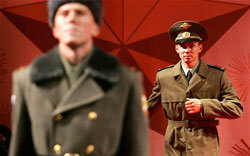 The Russian armed forces modernised its uniform in 2008 with help from top fashion designer Valentin Yudashkin. Russia’s defense minister expressed horror on Monday that soldiers were still wrapping cloths around their feet instead of wearing socks, and vowed the historic practice must end this year. Russia’s military leaders have repeatedly vowed to ban the practice, dating back a hundred years, as part of an attempt to modernize the sprawling armed forces. “This is 2013. We are still talking about foot cloths,” Shoigu said, adding that he had seen the practice while visiting units in recent months. “Listen, I am amazed at such an attitude to our troops. Find the level of demand and solve this task,” the former emergencies minister ordered brusquely. b) Why are observers skeptical of the positive change this new law represents? b) What is the “re-education through labor” system in China? c) Why are human rights activists skeptical of the validity of this announced positive change? b) Why don’t Russian soldiers want the military to implement this change?